"Let's keep the shiny side up" were nearly the last words from the GM employee responsible for the safety briefing ahead of a drive for journalists through the windy roads of Georgia. One writer for a buff book didn't take that advice seriously enough and rolled a brand new Cadillac ATS into the woods within a few miles from the race track we were driving to that morning. Everyone in the car was fine and I have many great things to say about the safety equipment built into the ATS that I don't think are embargoed. One of the stranger sights in my life was coming around the corner in an ATS to see two fellow writers on the side of the road waving their hands for help and seeing no car. "Where was the hell is the car?" was the question everyone in my ATS was wondering. My first thought was about the safety of the passengers in the car. Everyone was supposed to drive with a GM person in the car. This was probably partially to have a "minder" with us, but it's actually a big help to have an engineer with you to answer questions as you're driving. When we came across the car we only saw journalists and my mind flashed to an image of the poor Cadillac PR person I imagined trapped inside the missing car. When we caught up with the Motor Trend writer and his photographer we inquired as to where the car was and they pointed to a hole in the dense Georgia woods. They'd gone out on their own so no one was missing. Sure enough, there was an ATS completely upside down with the airbags popped and the rear door opened from their escape. Despite being a pre-production model the OnStar system worked and help was en route. Neither driver nor photog had more than a scratch on them. Given how the crash looked this seemed incredible. 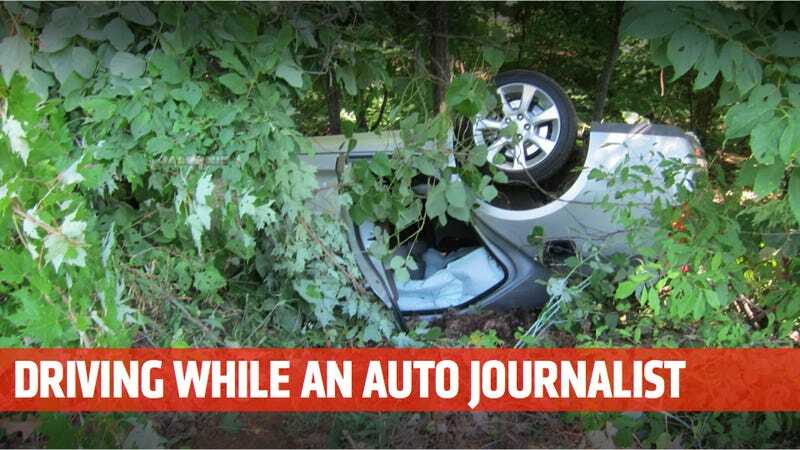 The Motor Trend writer said he was driving spiritedly when he put a wheel off, lost control, overcorrected, and ended up rolling backwards towards the woods. He didn't flip it in the conventional sense (something difficult with modern electronic nannies) but instead went off at an awkward angle and rolled off the hill at what he estimates was about 15 mph. I don't know the speed he was doing when he crashed. The driver tried to insist he wasn't going that fast, but the brake marks made this claim seem highly dubious. It seemed to me that he was probably going too hard into the corner for a quick drive on public roads. Especially given the fact that he was almost to the track. Had they gone off just 20 feet earlier they'd have fallen down a treeless section roughly 100 feet down into the woods. We'd have never seen them and they could have easily done major damage to themselves. They were lucky. Cadillac, for their part, appear to have a good playbook for dealing with overenthusiastic journalists and got the two buff bookers cleaned up and back to the track in a short time. That's right, as we've said before, short of killing yourself or someone else there's essentially no repercussions for doing something like this if you have a big enough name or audience. Motor Trend could do something to the writer, but I sort of doubt it. We've all been guilty of driving too fast on public roads at one time or another, most of us are just lucky enough not to crash. In all seriousness, despite Matt's innuendo, I am not the insane, arrogant, over-driving "buff book" editor that I'm purported to be. Matt may question my version of the events, but two Georgia State Troopers and a Dawson County Sheriff's Deputy found it credible enough to not cite me. I didn't tell them what magazine I worked for until they were leaving and I had exactly $1 in my wallet, so it wasn't some good ol' boy payoff, either. For those interested, here's my version of the events, which only my video producer (not photographer) can corroborate, since he was the only other person present. The turn was a downhill S-turn, a sweeping left into a sweeping right. The speed limit on GA 136 is 55 mph, and despite Matt's suggestion, I wasn't speeding. As he points out, we were on the way to Atlanta Motorsports Park where we could speed to our hearts content, so there was no reason to go hard on a public road. Never mind that I just spent two weeks in a GT500 and a ZL1 to produce our recent comparison test, which included track time. There was simply no motivation to be reckless, I'd already gotten my jollies and was about to get more. My mistake was misjudging the corner. It was tighter than I thought and I didn't brake quite as much as I should have. As a result, I tracked wide at the exit and was left with a choice: tighten the line right before making a sharp right turn and risk upsetting the car that way, or let it run a little wide into the shoulder and drive back onto the road. I chose the second option. With the pavement ending at the white line, driving into the shoulder meant into the dirt, which was far softer than I thought. The car immediately turned sideways, and while I counter-steered, the car was sliding at a 90-degree angle across the road. Thankfully, there was no on-coming traffic. We slid sideways onto the opposite shoulder, and in all truthfulness, if we'd stopped three feet shorter, you wouldn't be reading this. I remember hoping to myself that the car wouldn't get stuck in the dirt and need to be pulled out. As it happened, our momentum carried us just far enough for the nose of the car to go off the hill. Once it did, gravity took over and the rest of the car slowly followed. It was the least-violent or exciting rollover you'd ever seen. It slowly tipped onto its side, then onto the roof and slid a few feet down the hill before coming to rest against a tree. As Matt noted, we're lucky it wasn't 20 feet up the hill where someone else had gone off in the past and cleared out all the trees, leaving only sharp rocks. I've done a few stupid things in my life, but I'll sleep soundly tonight knowing that this wasn't one of them. If I'd really hot-dogged this car off the road in a fit of teenage-type recklessness, I wouldn't be showing my face here or anywhere else. But I didn't. I made a bad judgment call and it ended badly, though not as badly as it could've. I'll gladly bear the shame of it because I am responsible, but the Matt Hardigrees of the world aren't going to get me down. To those of you forming the lynch mob, I live in west Los Angeles, so dress accordingly. It's been hot lately.